Are you searching high quality 3 star hotel in Kerala? Siddhartha Regency is one of the best 3 star hotel in Kerala which has good infrastructure facilities, food facilities and services. Read here about Facilities, services and contact details of Siddhartha Regency. The Siddhartha Regency is a simple and high quality hotel in Kerala. The hotel is looking good and a luxurious place in moderate cost. 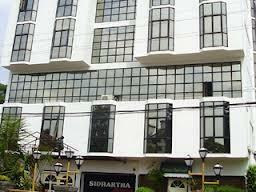 Hotel Siddhartha is 3 star luxurious hotel which is built in the hearts of Thrichur Town. It makes a memorable event each and every time you visit Siddhartha. This Group of hotel is managed by Sidharthan who has many years if experience in this field "Golden Fork Group". Siddhartha has many branches located in Middle East and in India. They provide great facilities for guest and provided they take care of guests at great extent. The Siddhartha Regency is located in Trissur in Kerala. We don't need to search for Hotel because it is locate in the Trissur Central Area. To accommodate in an average cost Prince hotel is the best choice it comes with air conditioned Rooms with single, Double Bed rooms and Suite rooms also available according to the convenience of Guests. For extra persons they are charging. All these fares may vary accordingly and excluded taxes. The Siddhartha Regency is fully air conditioned and it is well maintained with hygiene and good in surroundings provided many tourist spots are surrounded to this Siddhartha Regency. Reservation facilities also available in Peak timings and Credit and debit cards are accepted in Siddhartha Regency. There are totally 42 rooms and the checkout time will be 12:00.The Bathrooms are attached to the room, direct dialing facility, Room Services and Hot & Cold water facility also available according to guests. The Restaurants available here are mostly of Kerala Cuisine with both Indian and international also which is good in excellence. Next about the Lobby facilities are spacious and convenient which allows you to thrive in pleasure. In addition to that an Antique shop is available in the same building for ornaments and other curious. Liquors of our choice can also be done here. The Big spacious and luxurious, traditional boats have everything inside it. Next major thing in Siddhartha Regency is outdoor swimming pool, designed for glossy flooring which is crystal clear water through which you can swim up to your pleasures extent. The Prince hotel comes with reservation and almost all card are accepted here, Users rated for this hotel 3 stars and though it has many features included in it provided features are great and interior and exterior of Prince Hotel is really amusing each and every Guest. People coming to Kerala will surely place there foots in Prince Hotel because of its Interior and Outdoor from the Trissur Central. More tourists spots available in and around the hotel and provided a breeze of air in the evening gives an immense pleasure which tends to retain there. Let us have a Contact Details.